Moon­al­ice is a band that com­mis­sions a poster for every gig and gives them away for free. Since the band’s for­ma­tion in 2007, Moon­al­ice has pro­duced a unique series of almost 550 orig­i­nal gig posters with art­work from over 20 artists. On Sun­day, Octo­ber 28, 2012, Moon­al­ice proudly presents their 2nd poster show at the Brook­lyn Bowl. The full series of Moon­al­ice posters will be on dis­play and avail­able for pur­chase at this FREEEast Coast event. Many Moon­al­ice poster artists will be attend­ing the event in-person. 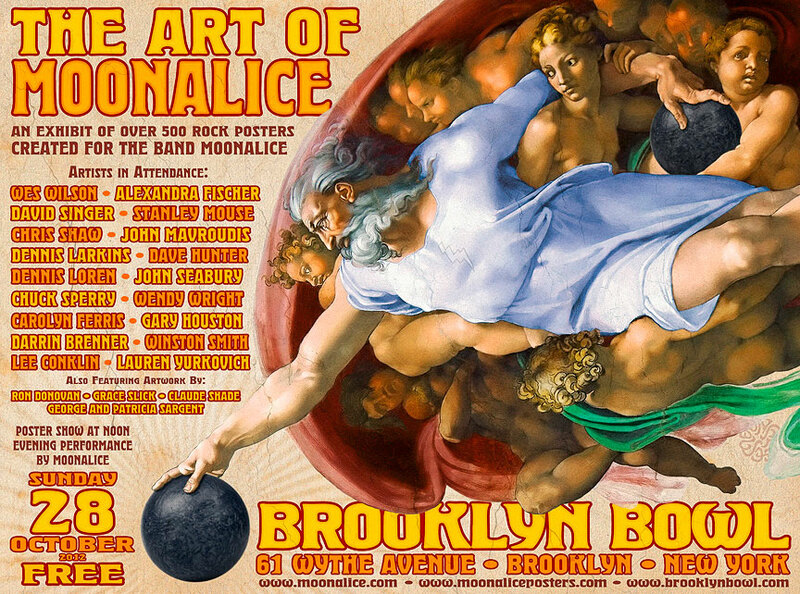 The poster show opens at noon, Moonalice’s con­cert will fol­low the poster show in the evening. This event is listed on Face­book.